"I always wanted to waltz in Berlin," warbled American songwriter Jack Little blithely in a World War II ditty, "the way things look, we'll be waltzing right in... right in to Germany." With that tune, Gandini Juggling waltzed into our hearts in the opening number of Smashed, which opened Tuesday night at the Hong Kong Arts Festival. You don't have to peel too many layers to get to the dark heart of Smashed, but the astonishing deftness with which this troupe of nine keep apples and crockery flying through the air to the accompaniment of Tammy Wynette, Louis Armstrong, and Bach, the gaiety and ludicrousness of it all, kept the audience in stitches. With the ghost of Pina Bausch visible in the wings, the descent into chaos seemed inevitable. Precise formations and complex, mathematically driven sequences in which the performers periodically pilfer a flying apple, without skipping a beat, gradually start to unwind. Attempts at sabotage intensify, in elaborate schemes that test the jugglers' virtuosity and create achingly beautiful spectacles. The nonchalance displayed by these athlete-dancers belies their arduous training and powers of concentration. 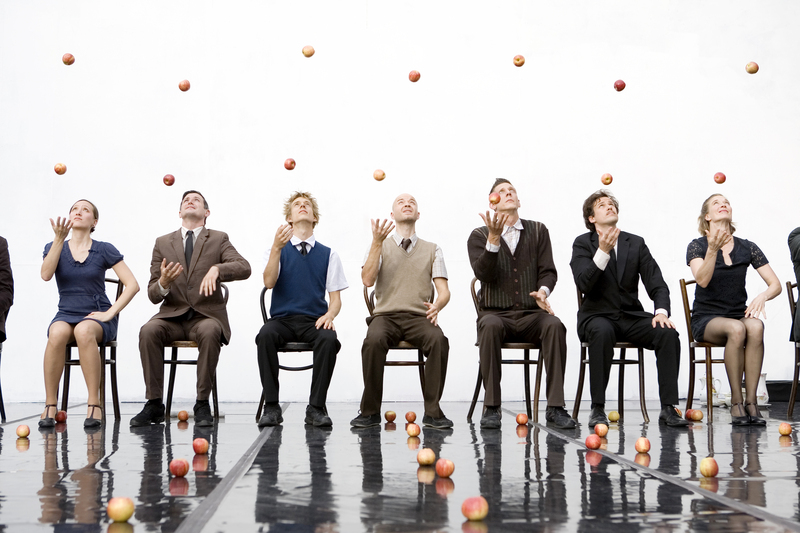 In this ingenious piece of dance theatre, juggling is the language the dancers use to convey their moods, desires, and frustrations - like the sensual pas de deux in which the dancers' bodies intertwine while they keep apples hurtling through space, or roll apples down each other's bodies. Juggling is also a metaphor for the order we try to impose on our lives, for our carving out of personal space, and for our daily routines - many of which, as Bausch often reminded us, are pointless and absurd. As in much of Bausch's work, the performers place each other in awkward, uncomfortable situations: women are pawed by the men; one man is deliberately ostracized; come-ons are unreciprocated; an apple is pitched like a fastball, nearly grazing another performer's head. Tragic country diva Tammy Wynette intones "sometimes it's hard to be a woman," and urges women to "stand by your man," as the two female jugglers crawl on all fours, in a bizarre assembly line, while the men roll apples off their backs. There is a wide-eyed, kooky charm to some of the games these dancers play. One woman carefully hoards apples under her skirt. She then approaches each of the men in turn. They are sitting in chairs. She stands in front of one of them, her legs straddling his chair, then plops an apple in his lap. She repeats this with each of them. The effect is ineffably sweet rather than provocative. Miraculously, our nine intrepid jugglers emerged from the carnage unscathed, their sense of humour undimmed.